For his son, see Douglas Fairbanks Jr.
Douglas Fairbanks (born Douglas Elton Thomas Ullman; May 23, 1883 – December 12, 1939) was an American actor, screenwriter, director, and producer. 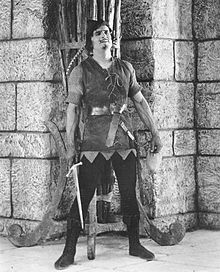 He was best known for his swashbuckling roles in silent films including The Thief of Bagdad, Robin Hood, and The Mark of Zorro but spent the early part of his career making comedies. 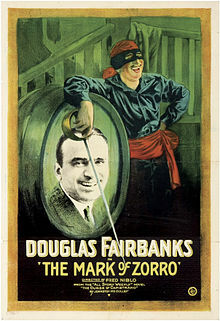 Fairbanks was a founding member of United Artists. He was also a founding member of The Motion Picture Academy and hosted the 1st Academy Awards in 1929. With his marriage to Mary Pickford in 1920, the couple became Hollywood royalty and Fairbanks was referred to as "The King of Hollywood", a nickname later passed on to actor Clark Gable. Fairbanks was born Douglas Elton Thomas Ullman (spelled "Ulman" by Douglas Fairbanks Jr. in his memoirs) in Denver, Colorado, the son of Hezekiah Charles Ullman (September 15, 1833 – February 23, 1915) and Ella Adelaide (née Marsh; 1847–1915). 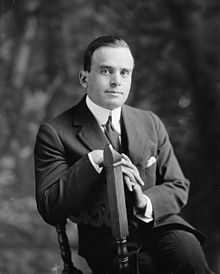 He had two half-brothers, John Fairbanks, Jr. (born 1873) and Norris Wilcox (February 20, 1876 – October 21, 1946), and a full brother, Robert Payne Ullman (March 13, 1882 – February 22, 1948). His father was born in Berrysburg, Pennsylvania, and raised in Williamsport. He was the fourth child in a Jewish family consisting of six sons and four daughters. Charles's parents, Lazarus Ullman and Lydia Abrahams, had immigrated to the U.S. in 1830 from Baden, Germany. After two years he moved to New York, where he found his first Broadway role in Her Lord and Master, which premiered in February 1902. He worked in a hardware store and as a clerk in a Wall Street office between acting jobs. His Broadway appearances included the popular A Gentleman from Mississippi in 1908–09. On July 11, 1907, Fairbanks married Anna Beth Sully, the daughter of wealthy industrialist Daniel J. Sully, in Watch Hill, Rhode Island. They had one son, Douglas Fairbanks Jr., also a noted actor. In 1915, the family moved to Los Angeles. Fairbanks speaking in front of a crowd at a 1918 war bond drive in New York City. While Fairbanks had flourished in the silent genre, the restrictions of early sound films dulled his enthusiasm for film-making. His athletic abilities and general health also began to decline at this time, in part due to his years of chain-smoking. On March 29, 1928, at Pickford's bungalow, United Artists brought together Pickford, Fairbanks, Charlie Chaplin, Norma Talmadge, Gloria Swanson, John Barrymore, D.W. Griffith and Dolores del Rio to speak on the radio show The Dodge Brothers Hour to prove Fairbanks could meet the challenge of talking movies. Fairbanks and Pickford separated in 1933, after he began an affair with Sylvia, Lady Ashley. Pickford had also been seen in the company of a high-profile industrialist. They divorced in 1936, with Pickford keeping the Pickfair estate. Fairbanks and Ashley were married in Paris in March 1936. He continued to be marginally involved in the film industry and United Artists, but his later years lacked the intense focus of his film years. His health continued to decline, and in his final years he lived at 705 Ocean Front (now Pacific Coast Highway) in Santa Monica, California, although much of his time was spent traveling abroad with his third wife, Sylvia, Lady Ashley. On December 12, 1939, Fairbanks suffered a heart attack. He died later that day at his home in Santa Monica at the age of 56. His last words were reportedly, "I've never felt better." His funeral service was held at the Wee Kirk o' the Heather Church in Glendale's Forest Lawn Memorial Park Cemetery where he was placed in a crypt in the Great Mausoleum. Fairbanks's tomb at Hollywood Forever Cemetery. Two years following his death, he was removed from Forest Lawn by his widow, Sylvia, who commissioned an elaborate marble monument for him featuring a long rectangular reflecting pool, raised tomb, and classic Greek architecture in Hollywood Forever Cemetery in Los Angeles. The monument was dedicated in a ceremony held in October 1941, with Fairbanks's close friend Charlie Chaplin reading a remembrance. The remains of his son, Douglas Fairbanks Jr., were also interred there upon his death in May 2000. 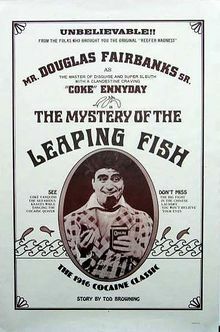 Reissue poster for 1916 cocaine comedy The Mystery of the Leaping Fish. ^ Obituary Variety, December 13, 1939, p. 54. ^ a b "Douglas Fairbanks Sr. Biography". The Douglas Fairbanks Museum. Archived from the original on May 15, 2008. ^ "Full text of "The Film Daily (Oct-Dec 1946)"". Archive.org. Retrieved 2016-02-16. ^ a b c d Goessel, TraceyThe First King of Hollywood; The Life of Douglas Fairbanks. Chicago Review Press, 2016. ^ "Alexander Street Press Authorization". Asp6new.alexanderstreet.com. Retrieved 2016-02-16. ^ a b "American Experience | Mary Pickford | People & Events". PBS. Retrieved June 5, 2011. ^ a b "Douglas Fairbanks". Flicker Alley. Archived from the original on August 16, 2013. Retrieved June 5, 2011. ^ Richard Corliss (June 17, 1996). "The King of Hollywood". Time Magazine. Retrieved August 10, 2008. ^ Douglas Fairbanks, Laugh and Live. New York, Britton, 1917. The work includes an afterward by journalist George Creel profiling Fairbanks as the epitome of American can-do manhood. ^ Vance, Jeffrey (2008). Douglas Fairbanks. Berkeley, CA: University of California Press, pp. 162–163. ^ "Pickford divorce made final". Chicago Daily Tribune. XCV (12). 14 January 1936. p. 3 – via newspapers.com. ^ "Mr Douglas Fairbanks weds Lady Ashley in Paris". The Scotsman (28, 948). 9 March 1936. p. 16 – via British Newspaper Archive. ^ "Doug Fairbanks Dies At His Home". Lawrence Journal-World. December 12, 1939. p. 10. Retrieved March 3, 2013. ^ Robinson, R. (2003). Famous Last Words. New York: Workman Publishing, p. 1. ^ "Drymeout.com blog". Blog.drymeout.com. April 29, 2010. Retrieved June 5, 2011. ^ Soares, Andre. "Douglas Fairbanks in THE GAUCHO Academy Screening". Altfg.com. Retrieved 2016-02-16. ^ "Douglas Fairbanks: The First King of Hollywood | Exhibitions Presented by the Academy of Motion Picture Arts and Sciences". Oscars.org. April 19, 2009. Archived from the original on March 9, 2010. Retrieved February 15, 2010. ^ "Laugh and Live: The Films of Douglas Fairbanks". MoMA. Retrieved 2016-02-16. ^ "'The Artist' is the buzz at the TCM Classic Film Festival". Latimesblogs.latimes.com. 2012-04-16. Retrieved 2016-02-16. ^ "Nickname "Gauchos"". Retrieved November 14, 2016. Goessel, Tracey (October 1, 2015). The First King of Hollywood: The Life of Douglas Fairbanks. Chicago, Illinois: Chicago Review Press. ISBN 978-1613734049. Vance, Jeffrey (December 8, 2008). Douglas Fairbanks. Berkeley, California: Academy Imprints/University of California Press. ISBN 978-0-520-25667-5. This page is based on the Wikipedia article Douglas Fairbanks; it is used under the Creative Commons Attribution-ShareAlike 3.0 Unported License (CC-BY-SA). You may redistribute it, verbatim or modified, providing that you comply with the terms of the CC-BY-SA.